Big W is having a pre-Christmas toy sale from this Thursday (31st October 2013) until Wednesday 13 November 2013. When it comes to LEGO there doesn’t seem to be any huge savings, but there are a few exclusives, and the chance to save a few dollars. You can view the catalogue here, or see a breakdown of the deals below. 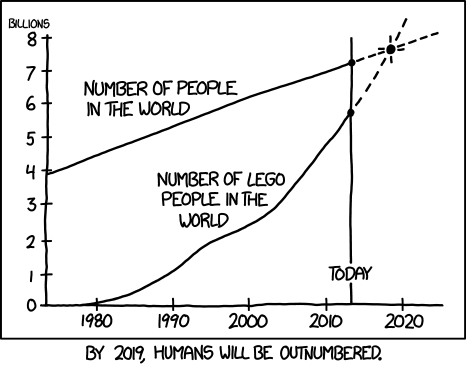 Here is a quick little fact about our favourite plastic people – by 2019 they are going to outnumber human beings. That is some pretty rapid population growth. Images for the 2014 Hobbit sets have started popping up online over the last few days. The sets feature scenes from the upcoming Desolation of Smaug – the second instalment of the trilogy. Toys R Us is celebrating their 20th birthday this weekend, and they are offering customers the chance to get in on the party with a special 20% off deal. The deal runs today, Saturday and Sunday only (18th – 20th October 2013). You will need to print out the voucher and take it with you, or use the promo code when buying online. Australian prices have been posted on the LEGO® online store for the two awesome sets that are coming out January 1st 2014. Spend $100 or more at the online LEGO store and receive this free limited edition Christmas Tree Stand set. It’s great to see that Australians aren’t missing out on a little Christmas bonus from LEGO. It’s time for another edition of the LEGO Club Magazine. Let’s have a look at what’s inside. Long weekends are far too rare of a treat, so when they come along you really have to make the most of them. That is something I certainly accomplished by heading to the 2013 BrisBricks Expo. Tickets were sold online and at the door based on pre-determined session times. The online ticketing system was incredibly straight forward and I didn’t have any problems. I purchased my ticket for the Monday 10:30am session at 11:55pm the night before. The staff at the event were more than happy to scan the barcode ticket on the screen of a mobile device, which is handy for those of us without easy access to a printer. What a difference a year makes! The venue for last year’s inaugural BrisBricks Expo was a little small, and a little hot. This year, the venue was incredibly spacious and not particularly hot, considering it was a sweltering Brisbane day outside. It was nice to see a variety of food vendors at the venue, as well as plenty of seating. There were lots of families having a bite to eat after a busy day of LEGO. As is quite common at these events there were a number of LEGO retailers offering bricks to adults and kids who were inspired by the displays. It was nice to see a variety of products on sale; such as sets, customised items and even individual minifigures. I managed to get the Series 11 Female Scientist that had been eluding me so far. It was great to see some new creations on display at the show. As this was the second BrisBricks event for the year I was concerned that there was going to be very little that I hadn’t seen before. There were certainly some things that I had seen previously but there were also some fantastic new creations. The interactive 4WD display. Giving fans a chance to drive RC cars over some tough terrain really showed how much fun Technic can be. Classic sets! As somebody far too young to have seen the original Town Plan set it was nice to be able to see that and other vintage sets on display. Royal Exhibition Building. Very impressive attention to detail and design. Movie Character City. This display very cleverly combined several famous characters into a single city street. Where else can you see the Ghost Busters and Marty McFly together? Be sure to check out the gallery below. The set features some great architectural styling as well as a lot of little details that bring the set to life, such as outdoor dining, gardens and a several printed elements. The set will be released in January 2014, but as yet there is no official Australian price. It’s very busy in the Parisian Restaurant. As a scooter zips by, inside the waiter rushes between the tables as the nervous young man gets ready to propose with the ring! It’s just as hectic behind the scenes, with the chef busily preparing the food. This beautifully detailed building is the setting for so many stories and is a great addition to the modular building series. The Parisian Restaurant has a fully-stocked, blue and white tiled kitchen with tableware as well as a cozy apartment with pull-down bed, kitchenette and fireplace. On the top floor is the artist’s room with a studio that includes a cast iron heater, easel, paintbrush and two works of art by the aspiring artist. Outside, stairs lead down to the roof terrace lined with hanging lanterns and flowers where the diners eat alfresco-style. This amazing Parisian Restaurant model even includes a facade with croissants, clams and feather details that recapture the feel of Paris. Includes 5 minifigures: chef, waiter, girl and a romantic couple. Includes 5 minifigures: chef, waiter, girl and a romantic couple. Also includes a rat, seagull and 2 clams. Kitchen features blue and white tiled floor, lots of kitchen units and a variety of utensils. Second-floor apartment features a pull-down bed, kitchenette and fireplace. Top floor features an opening roof revealing an artist’s studio with heater, easel, paintbrush, palette and artwork. Includes lots of food items for the customers including croissants, a pie, 2 cupcakes, 2 grapes, 2 hotdogs, turkey, cheese wedges, milk carton and coloured bottles. Also includes hard-to-find white croissants and bricks in olive green, dark blue and dark red. Intricate exterior details include facade with croissant detailing, bus stop, sidewalk, scooter and even a dumpster and trash can at the rear. Put up the printed restaurant sign and menu to entice the customers in. Measures over 11” (30cm) high, 9” (25cm) long and 9” (25cm) wide. Brisbane LEGO fans have a lot to look forward to this weekend with the BrisBricks Brisbane LEGO® Fan Expo running Saturday, Sunday and Monday. There will also be a special session for children with autism.